Agusta Agustsson asks her students to fill out a form at the end of each class, placing them in a designated tray as they leave the art room. Students indicate a Studio Habit, explain why they chose it, and describe what they learned. Agusta discusses her exit ticket, ​“I deliberately left off "understand art worlds" because my students would have limited themselves in connections to their worlds. Middle schoolers can be quite literal. . .Over the course of their time with me, their conception of art [enlarges], I didn't want to throw up a roadblock in the beginning. I wanted them to feel that anything could become the subject or material of art. . .The exit ticket [serves] two main purposes. First it [makes] students reflect on what they [accomplish]. Secondly, it [teaches] them the vocabulary of artistic thinking. The vocabulary can be intimidating, especially for the large numbers of English language learners and special needs students." ​Students in Bethany Haizlett-Naraikja enjoy interviewing each other about the artworks they’ve created. ​Celia Knight uses this short form to help first graders use Reflect: Question & Explain with works from their painting unit. ​Chrissy Grey Rodriquez's students reflect on what they are most proud. ​These are separate worksheets, designed by Diane Jaquith, for each Studio Habit that students can use to assess themselves while they work. Diane Jaquith used this form to help her see students’ skills in Reflect: Question & Explain. She implemented this during a Printmaking project. ​Julie Toole’s middle schoolers choose what they’d like to reflect upon in their weekly reflection form. 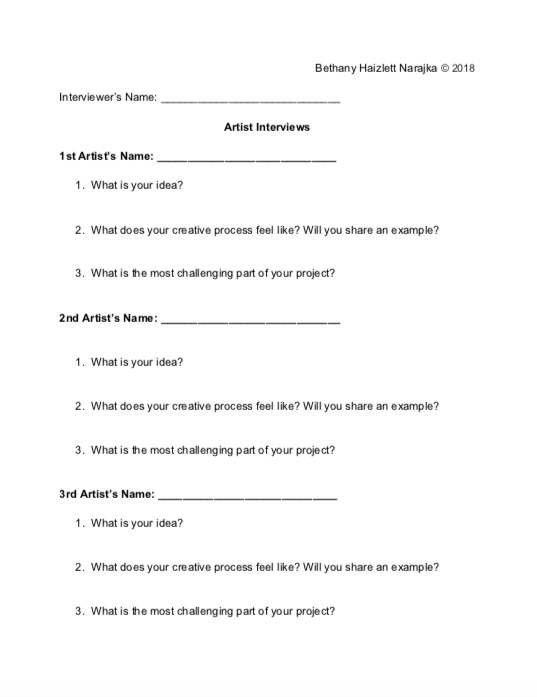 ​Lauren Gould's students reflect on their artworks by completing an artist statement form. ​Lauren Gould uses a goal-setting and reflection sheet to help her students think about Develop Craft. understanding of their learning through the lens of Studio Thinking. Quarterly, students review their Studio Habit accomplishments to discover trends and patterns, turning in a one-paragraph summary for a grade.